If I told you I made a smoothie that tasted like the leftover milk that you drink after eating a bowl of Lucky Charms, was good for you and low in carbs...would you believe me? Well you should because it is all true :) If anyone reading has no clue what Lucky Charms tastes like, its like a bowl full of sugary marshmallow heaven that brings me way back. I'm actually not the one that came up with that description for this smoothie recipe. The whole it tastes like "Lucky Charms" bit came from my brother-in-law's sweet girlfriend who was forced by me to take a sip after she looked in horror as I was drinking this green smoothie saying "Mmm" out loud as everyone was eating chips and pizza. I took a sip after she said the whole Lucky Charm description thing and I could not believe how right she was! So if you like Lucky Charms you will like this. Oh and adding a cute striped straw makes it just a tad more appealing right? So if you want to make your green smoothie more appealing head to Target and pick up a whole little pack for a mere $2. Please come back and let me know what you think if you make this! This smoothie has only 4 grams of effective carbohydrate! Can I get a hallelujah! Lucky Charms?! I am in! Oh my goodness. Going to give it a try. It only has 4 grams?? Amazing. It's funny I used to be turned off my the look of green smoothies, but now, I think they look good! Happy Monday friend! You always have the best recipes!! Can't wait to try this one. I probably eat that 2 minute blueberry muffin everyday! Do you have a brand of stevia you prefer? I haven't played around too much with it. Mm this sounds delicious! For some reason it reminds me of vanilla marshmallows and now Saturday morning cartoons :) If I was able to drink Lucky Charms, praise the Lord ive found it! Ooh! Can't wait to try it! As for the roasted flax seeds, do you just toast them in a pan or do you buy roasted flax seeds? I love vanilla almond milk! Looks like a perfect power smoothie! My husband volunteered to make this for me after I told him how excited I was about it. We only had regular liquid stevia so I used that and just added vanilla. My husband couldn't find roasted flax seed anywhere so we roasted some flax meal that we already had (we will find the real thing for next time but it seemed to work). The result: BEST MOST DELICIOUS GREEN SMOOTHIE EVER. Thank you for making my day. Yay for 4 carbs of awesome. Also my husband, who I didn't even think would have dared to try it with all the healthy green ingredients, said "It's weird because it really does taste like the Lucky Charms milk. uh that's awesome. i look forward to living in a big apartment where i can have a blender. it will be glorious. (and yes, my kitchen is the size of a postage stamp). Made this today. I used kale instead of spinach (what I had) and didn't have any flax seeds. I loved it! It will make a fun smoothie for the kids on st pattys day. BTW, I have made every muffin in a mug recipe you have on here and my kids love them all. Our whole family eats paleo, so it is nice to offer them something other than eggs and leftovers for breakfast. And something fast! : ) So, thanks! I am going to try this today! I have hated the taste of stevia in the past and was told about this brand. I only have the powder, but it does come in drops. It really does not have the "bad taste' of other stevia I have tried. I adore your blog btw! Thank you. Made this smoothie this morning for breakfast! We didn't have vanilla stevia so I used regular and added some good ‘ol vanilla extract! DELICIOUS! Such a satisfying smoothie, first time I’ve tried one with spinach and it was amazing. As far as the Lucky Charm milk thing goes... that is 100% accurate I couldn’t believe it, it really does taste like the milk after a bowl of lucky charms!!! I tried and LOVED this smoothie! However, instead of stevia, I used a tablespoon of honey. I also added a big dollop of greek yogurt, which made this smoothie oh-so-smooth. the dominant flavor of vanilla will surely make the smoothie tastes great. I loved smoothies! Never tried green ones! It looks fresh and healthy! Thanks for great sharing! AH-mazing. LOVED. Used coconut milk instead of almond. I always pour it into a recycled starbucks glass bottle (from way back when I'd drink that stuff) with a polka dot straw. makes it extra delicious! Looks yummy! 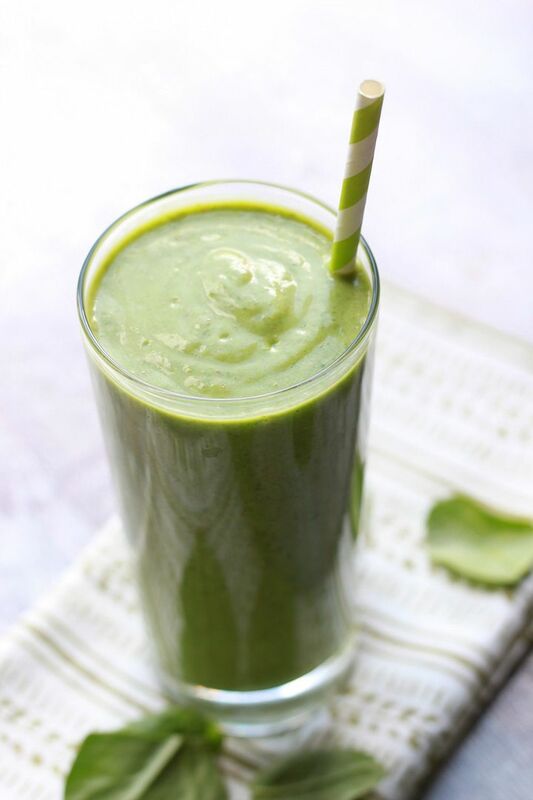 Surely it's one of the best ways to make healthy green smoothie! Thanks for sharing it. It really does taste like Lucky Charms! so good! Hi Lindsay, what brand vanilla stevia and unsweetened vanilla almond milk do you use in your Low Carb Green Smoothie? If I have to go with total carbs for gestational diabetes (nobody taught me net, so I'm assuming I have to stick with 15 for snacks - nothing modified??) do you know off the top of your head how many are in one serving? Oh! And one more question-I use pure vanilla extract, so I assume the 'alcohol' in the vanilla stevia is minimal/safe for pregnancy? Sorry for all the questions. I'm new to gestational diabetes, and not loving it :) But I am so grateful for you sharing your knowledge and recipes!! Loved it! Didnt have any vanilla stevia just regular, so i just added a few drops of vanilla extract and it was so good! Thanks for the recipe. Its the only delicious low carb green smoothie i could find! Surprisingly delicious! And it totally does remind me of Lucky Charms! Thanks!! I'm new to using avocados, what kind should I use for smoothies? Lindsay, I just discovered your blog and I love it! You have a gift in expressing yourself well and your awesome personality comes through! Several people asked about the roasted flax seeds. I tried roasting myself, then found Golden Roasted Flax Seed at Trader Joe's which are much better. They are amazing in this smoothie, Greek yogurt, muffins, etc! So, so yummy. I used unsweetened coconut milk and toasted my own flax like another commenter did. My husband is sipping it now. This has become one of my staples- surprisingly filling and so yummy! I don't include the flax seeds though, and it is still tastes great. Does anyone have the full nutrition content? Thanks! I made this for breakfast this morning and it was DELISH! I used Truvia instead of liquid Stevia and did it in a food processor (messy and don't recommend). I am off to buy a Nutri Ninja this weekend! The toasted flax seed made the difference! Karen, The protein is in the spinach, 1.68 g, 1/2 avocado 2.01, almond milk has 2-3 g protein depending on manufacturer and brand and flax seeds have 1.28 g for a total of 6.97 or 7.97 depending on the protein content of the brand of almond milk. Made this this morning.. fantastic flavor BUT only using 2 ice cubes made the smoothie complete liquid?? Not sure what I did wrong... I added some more cubes in hopes to get it to a smoothie consistency and it became sludgy. :( any suggestions?